(CNS): In the early hours of Thursday morning the tenth tropical depression of the season formed some 435 miles WSW of the southernmost Cape Verde Islands. The NHC stated that the depression was expected to become a storm sometime today. 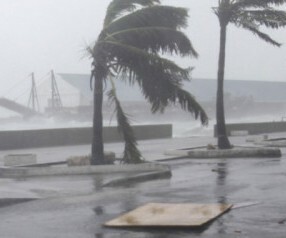 Meanwhile, Irene is still battering the Bahamas causing extensive damage on some of the country’s smaller islands. At 10am local time the NHC said Irene was around 75 miles NNE of the capital Nassau which is believed to have escaped the worst of the hurricane. Irene is moving towards the north-northwest at 13 mph with maximum sustained winds of almost 115 mph making the storm a category three dangerous hurricane with further strengthening possible today or tonight. Hurricane force winds currently extend outward up to 70 miles from the centre but tropical storm force winds extend outward a further 290 miles. Forecasters expect Irene to continue on its NNW track through tonight with a turn toward the north by early Friday. The core of the hurricane will move over the north-western Bahamas today and pass well offshore of the east coast of central and north Florida tonight and early tomorrow. Irene is forecast to approach the coast of North Carolina on Saturday. Lawd have mercy! I have to go to the store to buy some canned food and water just in case but I have no money. Good thing I have my chickens. Hopefully the next storm is small or goes somewhere else.